An old shape, with precursors in the eighth century, the hydria (pl. 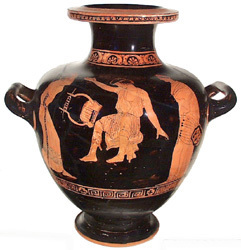 hydriai; compare Greek hudor - water) is a water-jar with three handles, two for carrying and one for pouring. The application of the name to the shape is reasonably certain, although such vessels were not only used for the carrying of water. We know, for example, that hydriai held votes in ballots and ashes in cemeteries. 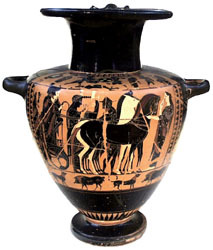 Athenian red-figure hydria ht. 27cm. The hydria is found in a variety of forms in black- and red-figure, as well as in metal. 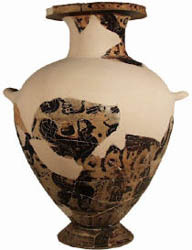 In early black-figure, examples are round-bodied, with horizontal handles about halfway up. By the mid-sixth century, the sharply-shouldered type has been developed, often decorated in three zones - the shoulder, the body and the predella. Examples are found in red-figure as well as black-, but the more typical red-figure shape is round-shouldered. It was invented in the late-sixth century, and over the course of fifth and fourth centuries becomes slimmer, and its handles more tightly curled. The Greek term kalpis (pl. kalpides) is often used today for this version, although it is not clear whether it had the same association in antiquity.